For a Free Quote, contact us immediately. We will try and assist you as soon as possible. • Express repair center incorporated. 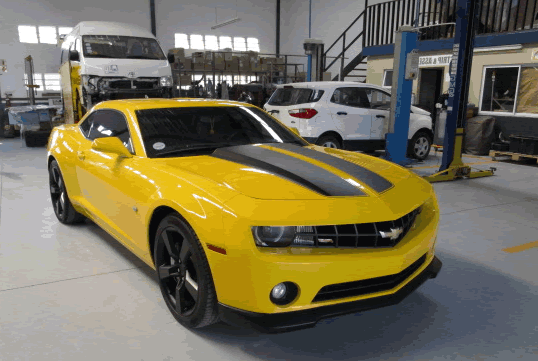 • Eden Coachworks is an Auto Body Repair Facility focused to provide excellent personal service combined with extremely good quality repairs to their customer’s vehicles. • After parking your vehicle under shaded customer parking, feel welcome entering our reception area with comfortable seating and internet facilities in our quest lounge with refreshments available. Our always friendly receptionist are there to welcome you and assist or directing you for the best advise from our well trained staff. • Hurricane H100 spray-booth/combination oven with the correct lighting and filtration system, Commercial Paint Mixing room with positive pressure and filtration, Glasurit Manufacturer Approved paint system and mixing scale. • Up to date color profiles and Ultra-violet simulating light, Paint thickness measuring gauge, Duel Paint Primer application and preparation bays with under floor extraction, a mobile dry sanding system. We are also a Glasurit Lifetime Warranty approved repair centre. ♦ There is a stand-alone Wash-bay where we also do anything form Wash & Go to Full Valet services. ♦ All work is done by hand with accompanied by the use of a Hand Held High-Pressure Water Wash.
• Chief EZ Liner 25 vehicle and chassis straightening bench. • EL 300+ Ezcalipre 3-Dimentional Measurement system for accurate measurements on structural repaired vehicles as per the manufacturer specifications. • 3000Kg two post baseless host. • Two express repair bays. • PDR (Paintless Dent Removal) bay. • 20 ton bearing press and coil spring compressor. • Inverter Gyspot 13000 Amp Spot Welder for High Strength (HS). • Ultra High Strength (UHS) and Boran Steel spot-welding. • Cebora Mig-Brazing brazing welder for copper brazing. • GYS tri-mig inverter welder capable of welding three different steel types, aluminum and copper brazing. • Teco HL180 Headlight aimer for correct focusing of Headlamp. • Lockable Parts-Store for safekeeping of new replacement components. • Separate Parts-Store for stripped or damaged parts out of sight. • Holding bays for non drivable accident damaged vehicles inside the main building. • We also do small to medium Mag-wheel refurbishments, not including straightening of buckled steel rims or Mag-wheels.